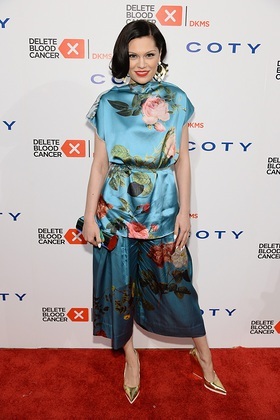 Georgia May Jagger, Coco Rocha and Dita Von Teese were just a few of the supporters at this week’s 2014 Delete Blood Cancer Gala at Cipriani Wall Street in New York. The event was hosted by Chris Tucker and Delete Blood Cancer co-founder and board member Katharina Harf with Honorary Gala Chairman Michele Scannavini, CEO Coty Inc. The evening featured performances by Jessie J and L.P.
Additional guests included Rachel Roy, Kimberly Chandler, Doutzen Kroes, Elettra Wiedemann, Julie Henderson, Kelly Bensimon, James Marshall, Teresa Moore (model) and Anastasia Ganias (actress). Evan Sohn and The Sohn Conference Foundation were honored. Delete Blood Cancer (DBC) started with one family’s search for a bone marrow donor and is today part of the world’s largest bone marrow donor center. DBC has registered more than 4.2 million potential donors and facilitated more than 41,000 life-saving transplants. For more information or to register as a bone marrow donor, please visit www.deletebloodcancer.org.